Overview-How Can ‘High Voltage Detox’ Help You? High Voltage Detox drink may slightly increase your chances of passing the urine drug test. Getting a job as a recreational drug user isn’t easy. This is particularly true if getting the job entails passing a urine drug test. Imagine doing marijuana last night and being asked to submit a urine sample for testing today. Well, you’re definitely going to fail. Even if you find out that you’ll need to submit a urine sample tomorrow, that’s still not enough time for your body to clear the chemicals out of your system. This is where High Voltage Detox drink comes in as an agent to help you pass your urine drug test so you can get the job. Those of you who are on prescription meds have nothing to worry about. You really don’t need to worry about detoxing. Just inform your potential employer that you’re on a prescription and give them your doctor’s contact information so they can confirm with your doctor if they wish. If you’re doing drugs recreationally though, you’ll be in a tight spot. High Voltage mostly has negative reviews and hasn’t been medically tested. However, if you don’t really have other options, so you might as well give it a shot. High Voltage claims to work by inhibiting or minimizing the release of toxins into your blood stream. When you use drugs like marijuana, they’re stored in your body’s fat cells. As time passes and you burn these fat cells, the drugs are released into the blood stream. It is through your blood that the drugs eventually end up in your urine where they can be detected by a simple urine drug test. High Voltage claims that it stops the burning of the fat cells that release the drugs and chemicals into your blood that ultimately ends up in your urine. Nonetheless, we contend that High Voltage isn’t unique in working the way the company claims. It’s our view that the detox drink works like any other detox drink available on the market. This is by simply diluting your urine so that the concentration of drugs becomes so low that they’re undetectable by lab tests. Detox drinks should start working 45 minutes from the time taken and last for up to 7 hours. By diluting the urine, High Voltage detox drink should theoretically work for all drugs, not just marijuana. We highly doubt that High Voltage simply works by inhibiting the release of chemicals from fat cells into the bloodstream. Rather, our view that High Voltage relies simply by diluting the urine is substantiated by the fact that the company recommends you drink plenty of water with their product. We must point out that High Voltage hasn’t undergone medical tests. Therefore, its safety can’t be guaranteed. Products that increase urine output and flush the kidneys can be quite dangerous for people with kidney disease, regardless of the product’s nature or purpose. High Voltage Detox drink 16 oz is available in grape, cherry, berry, lemon lime, pomegranate, and orange flavors. High Voltage Detox is specially formulated with a blend of B-Vitamins, creatine and numerous nutrients and herbal extracts. 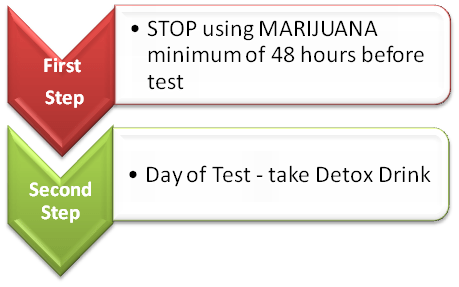 Minimum 48 hours before using High Voltage Detox drink, you must STOP using marijuana. The longer you refrain from using marijuana, the easier it is to mask the toxin in your urine. Shake and drink the entire bottle. Try to abstain from all drugs for at least 48 hours before taking the drug test. Drink at least 80oz of water the day before you have your urine drug test. Avoid acidic foods or drinks and those rich in sugar. Avoid exercise the day of the urine drug test. Try to urinate at least 3 times before the test. The drink is effective 45 minutes from when you finish it and up to 7 hours thereafter. Consult your doctor before using High Voltage Detox drink. Works within 45 minutes of taking and lasts up to 7 hours thereafter. Comes in several flavors including cherry, berry, grape, lemon lime, pomegranate, and orange. Lab tests are getting better at detecting artificially diluted urine. Medical studies haven’t confirmed its safety. Might not be safe or suitable for people with kidney disease. For any assistance regarding High Voltage Detox, contact www.amazon.com using email, phone, or online chat and they’ll be able to provide you with the assistance you need and answer your questions. High Voltage Detox is a drink that works by diluting urine in order to avoid the detection of drugs in drug tests. It’s not expensive and can easily be ordered online. The fact that it works within 45 minutes and its effects last up to 7 hours is great because you can just take it the morning of your scheduled drug test. Unfortunately the product’s mostly poor reviews make us doubt whether or not High Voltage Detox actually works. Nonetheless, those who are in a tight spot and have no other options may as well give the drink a try. You have nothing to lose, other than the job. It might even work and surprise you. Hope you found our High Voltage Detox review useful. If you’ve tried detoxing using High Voltage, let us know more in the comments so that others can gain and benefit from your valuable experience.